United Airlines announced on Tuesday that they were in the process of doing away with the voluminous stacks of paper flight manuals carried by each pilot. 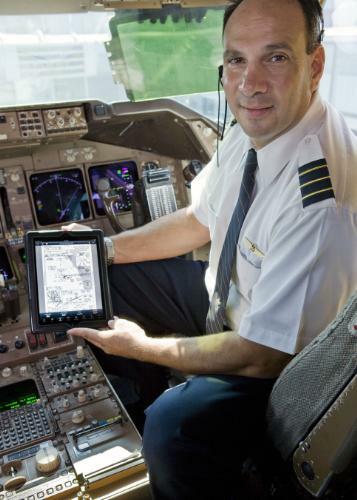 They started issuing iPads to pilots a few weeks ago, and expect to have them in the hands of all pilots by the end of the year. United are actually the second airline that I know of with a paperless flight deck. Alaska Airlines went paperless about 3 months back. Of course, the really interesting details (for me, at least) are the apps they use. AA went with PDFs and used GoodReader to display them. United chose to license Jeppesen Mobile FliteDeck, a custom iPad app featuring interactive, data-driven navigation information and worldwide terminal charts. I wonder if United will just shove the iPads at the pilots or if they'll pay for training? The Jeppesen app sounds like it could be complicated enough that the training might be a good idea. In any case, switching to an iPad means the airlines on the production and distribution costs of the 15 plus kilos of reference books, flight manuals, charts, logbooks, and errata that can be found in a pilot's flight bag. And it's also going to cut down on pilots smuggling stuff by burying it under all the paper. It will be rather not nice if the cool iPad shatters a screen during emergency. Paper books rather more resilient 🙂 . Would understand it being a Panasonic ToughPad or something similar.